Apple Power Mac Quad G5 In the modern world of the digital darkroom the G5 is the center of the entire process. Actually this computer is the center of my entire business so it is much more than just the digital darkroom. This computer is fast and was a huge upgrade from my previous Windows computer. The main reasons for switching was Aperture, color management and fonts. It didn't hurt that just about everything Apple does looks really nice. My only complaint is Apply only put one firewire 400 port on the back of the system and I have half a dozen firewire devices. I have used a couple firewire hubs but none of them are made very well and all die an untimely death and are very epensive so I'm reluctant to buy another one. Apple 30" Cinema Display This monitor is unbelievable. The first time you see one it's one of those things that makes you say "wow". I have compared it to some excellent CRTs and while they technically outperform any LCD this monitor comes very close, and with much more screen realestate. More screen realestate directly results in a better digital darkroom experience. And now that there are no good CRTs on the market the whole CRT vs LCD debate is over. There really isn't a better monitor you can currently get without paying a whole lot more money for a Eizo or LaCie monitor. One of the questions I get about the high price tag associated with Apple Cinema Displays is what about Dell. What about Dell? At the time of writing this they aren't all that much less money and they don't perform as well. 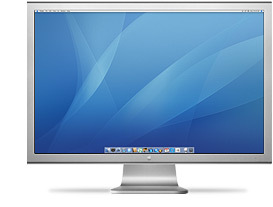 The Apple Cinema displays are one of the few LCD monitors that calibrate down to the brightness useful level for evaluating images for printing. I do have one suggestion though. Buy your monitor from a store so you can take it back if there are dead pixels or hot spots. I have two complaints about the Apple Cinema Displays. 1) The entire display has a matt finish except for the Apple logo right at the bottom in the middle. At night it's fine, but get a little reflection and it plays havok with your visual ability to judge colors. I think a little bit of 220 grit sandpaper would solve the problem but I'm reluctant to do so. 2) Each monitor has a firewire hub built in which is awesome, except if you run dual monitors because there is only one firewire 400 port on the back of the G5 or MacPro. 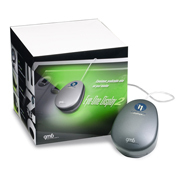 Gretag Macbeth Eye-One Display 2 Colorimeter For color calibration I use the Eye-One colorimeter. Remember, each monitor is not created equal and to get accurate images on screen you must calibrate your monitor. This is why I use a Mac. OS X has built in color calibration that all applications use. Windows doesn't work as well. Epson 4800 Epson invented the affordable color printer and they provide the best results. I use the Epson 4800 because it is relatively small, professional quality, allows me to print 16 inches wide and has 8 very large ink cartridges reducing my printing costs.